Don’t worry – I haven’t come over all “Nu Yoik“!! 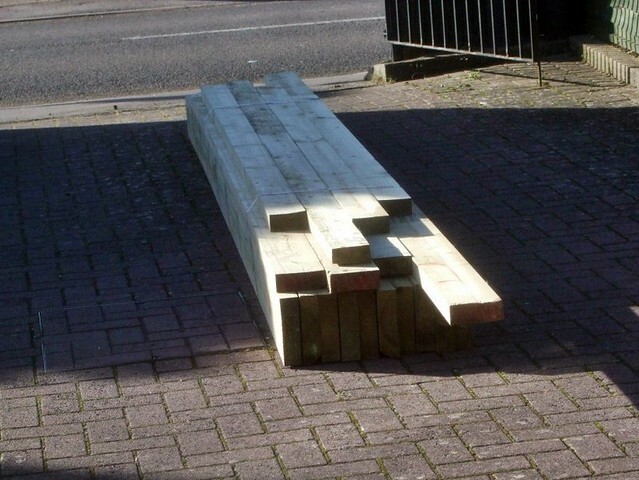 Tuesday afternoon saw the arrival of a bundle of pressure-treated, stress-graded softwood from my local BuildBase. All these long lengths were conveniently unloaded directly off the lorry with one of those grab-things on the back – a real godsend in saving both time and energy! This wood was purchased to allow me to fit a suspended, overhead, storage floor in my compact workshop – something for which I actually began planning for three-years ago! Most of the narrower stuff will be used to frame the inside of the roof, ready for insulation boards. It was cheaper for me to buy (and store!) this lot at the same time, as BuildBase offer free delivery on all orders of £200 or more (excluding VAT). Not pictured are the seven sheets of 2400 x 600 x 18mm MR chipboard flooring, which will be laid directly on top of the joists. After placing the order seven-days in advanced, I was surprised to receive a phone call with only a few minutes, confirming my order and offering next-day delivery!! Are all builder’s merchants this efficient?! If not for other arrangements I’d already made, I’d have happily taken all this wood on board to make an early start on this project.